If you aren’t part of my Aunt Maw Maw’s extended circle of friends, or a pal of my many cousins, or belong to the Life Activities Club of Geelong, then you might not have tried Aunt Maw’s date scones. 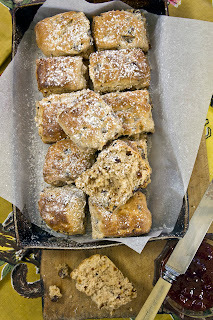 She is a legend in that wide circle, and her date scones are her pièce de résistance. 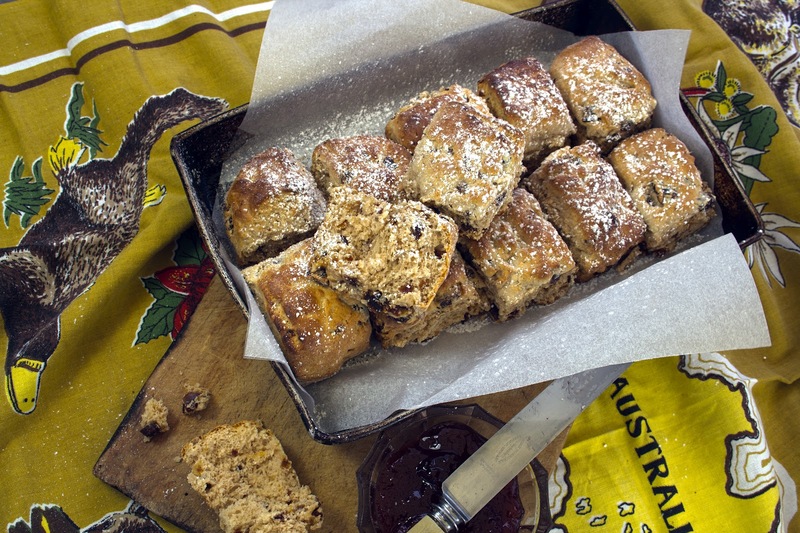 She’s one of those cooks that hail from the Margaret Fulton and Australian Women’s Weekly era of baking, with a consuming belief that eating cakes, biscuits and slices, with a nice cup of tea at the kitchen table, can make the world right. Her baking skills are widely known, with classic jam tarts, lamingtons and lemon slices the order of the day. Although tiny in stature, Aunt Maw Maw’s convictions and generosity are larger than life. She has a strong belief in the good of everyone, and conversations always start with a joke. In all the years of knowing her, I can’t ever remember her having a cross word with or about anyone. If you’re looking for something that sums up what she is truly, uniquely like, you don’t need to look past her role in the Life Activities Club as chief Hugger. She hugged everybody. Her repertoire of recipes has grown with her years of involvement in charity shops around Geelong. It was a reflection of her generosity, her capacity to hug and perhaps, the quality of her date scones, that made it a sad privilege to be part of the standing-room-only crowd at her funeral recently. When Uncle Harold went searching later for her recipe for the date scones, he found it tucked into a copy of the Australian Women’s Weekly cookbook, covered in flour, food stains and dog-eared. No prizes for guessing this was the right one. Well, Aunty Maw, I only hope you forgive me for the height of my scones. They will never be like yours. Sift the flour and salt into a bowl, rub in the butter until the mixture resembles fine breadcrumbs. Stir in the dates and sugar. Beat the egg and add to the dry ingredients with sufficient milk to make a soft dough. Place on a floured surface and knead lightly. Pat out to approximately ½ inch thickness and cut into squares with a knife. Place into a greased 28 x 18 centimetre lamington tin butted together closely. Glaze the tops with milk. Bake in a very hot oven for approximately 12 to 15 minutes. Makes about 12 scones. This was Maw Maw’s recipe, but I used a food processor to rub in the butter and added the dates, sugar, eggs and milk until it was mixed to a dough ball. I then tipped it out onto a floured surface and followed the instructions in the recipe. First published Canberra Times 11 April 2012. Last September when the fuss and flurry of Floriade was over, I was left with, what looked like, a gaggle of duck necks, which I threw in the freezer to deal with later. Well, later has now come, and I need to do something creative with them. Thus, my duck neck sausage was created. I was a little obsessed while working on what stuffing ingredients to include, and it was only when my sister phoned during a sensitive stage of the preparations and I described what I was doing, that I stopped to think what this dish might sound like to the uninitiated. Her response was, well, not what you’d call positive. But I persisted and the result is absolutely delicious, if fiddly, and for people like me who are dedicated to everything duck, an essential addition to your duck repertoire, that is if you have one. 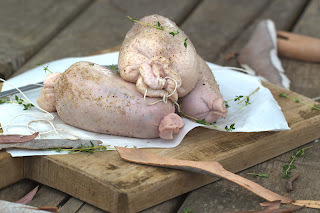 If you haven’t had the experience of cooking multiple duck breasts at Floriade, and aren’t left with a gaggle of duck necks, I believe you could approach a poultry supplier who could sell you the duck necks very cheaply. 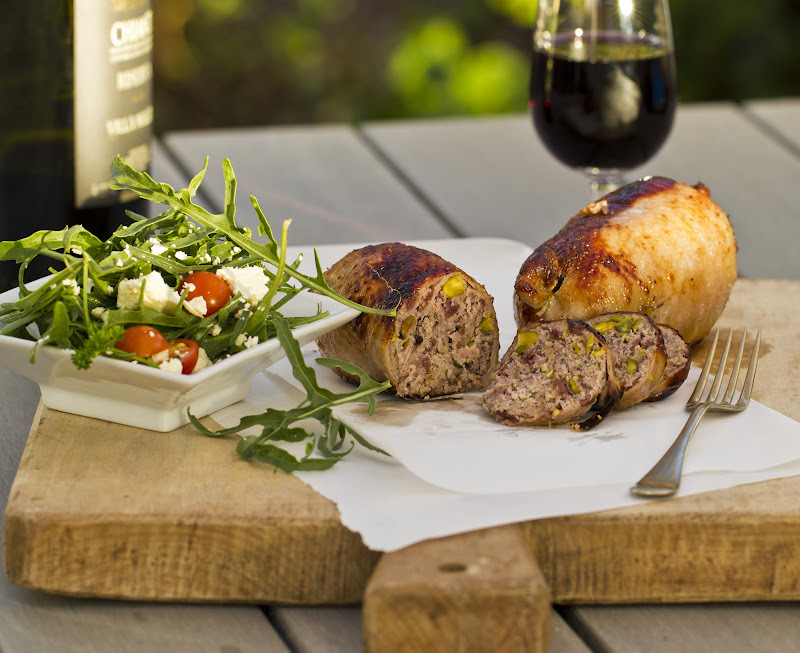 Don’t be put off by the duck neck thing - this is really a fun dish to make. I have provided quantities for 2 duck necks. If you have more necks, just increase the quantities of filling. You can buy duck fat in tubs from many supermarkets, Costco, poultry suppliers or delis. Costco has the best price. 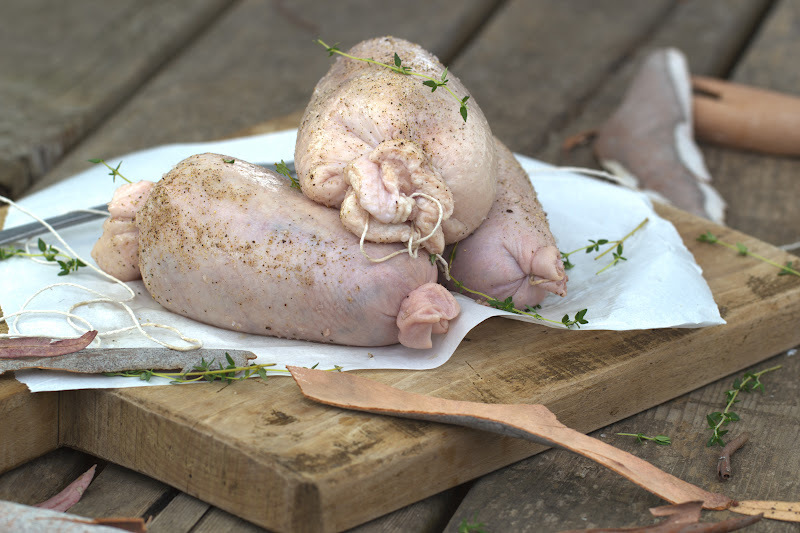 Strip the skin of the duck necks away from the windpipe, as if peeling off a glove. The skin will be attached to the windpipe by little fibres that pull away easily. Remove the windpipe from the skin and throw away. Wash the skin thoroughly, inside and out and pat dry. Place the chopped duck meat, flour, balsamic vinegar, pork mince, pork or duck fat, pistachios, cognac, thyme, cherries, five spice powder, lemon zest and salt and pepper into a mixer, that is fixed with a paddle attachment. Mix on medium speed for 2 to 3 minutes, or until well combined, although don’t overmix until the mixture turns pasty. Place the stuffing mixture into a piping bag. If you don’t feel confident with a piping bag, you could spoon the stuffing mixture in, just make sure you push it down. The filling should be packed in quite firmly and resemble a thick sausage. Heat the duck fat in a small medium saucepan, on low to medium or 90C. Tie a knot with kitchen string at the narrow end of the neck and pipe the stuffing mixture in, filling it well. Tie off the large end of the neck with another piece of string. Repeat with the second duck neck. Place the neck sausages into the saucepan of duck fat and cook for 30 to 40 minutes on low heat. Make sure the sausages are just covered in the melted duck fat and the heat remains low with just the occasional bubble. While the sausages are cooking through, preheat the oven to 200C. Remove the sausages from the saucepan, place on a baking tray and crisp up in the oven for about 15 to 20 minutes or until golden brown. Check they are not burning. When the sausages are crisped, remove from the oven, cover with foil and leave to rest for 10 minutes. Holding the sausage to maintain its shape, slice carefully into 1 cm slices with a sharp knife, throwing away the string. Serve with salad and a spicy chutney or pickle for the warmer months or with potato mash and vegetables for the cooler months. These are the best Hot Cross Buns you will ever eat. Although a little preparation is involved, the results will be well worth the effort. 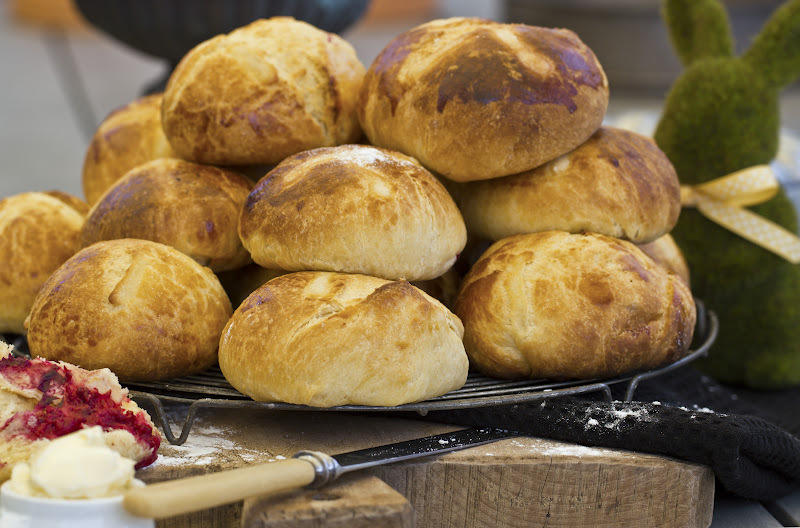 You can prepare the dough the day before, leave overnight and have the dough buns ready to cook in the morning. 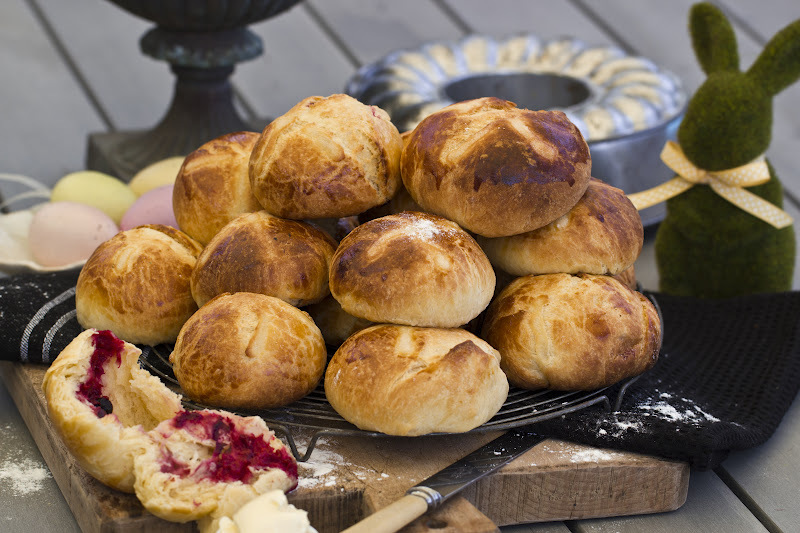 These buns are best eaten on the day, but can be rewarmed in the oven to freshen up the following day. 1.Stir the yeast into warm milk with 2 tsp caster sugar (extra) and set aside for about 10 minutes until very frothy. Sift the flour and salt into a bowl and set aside. 2. Place 1½ cups of flour into a mixer bowl with the dough hook attached. Add the frothy yeast liquid and beat for about 2 minutes. 3. Gradually beat in the remaining 4 cups of flour with the eggs and remaining sugar. Do this in about 3 or 4 batches. Once all these ingredients are incorporated, continue to beat for 5 minutes. Gradually add the thin slices of butter. It should be at room temperature but not too soft. This process takes about 20 minutes as you want the butter to be kneaded in without melting. Once all the butter is added continue to beat for a further 5 minutes. By now the dough should be coming away from the sides of the bowl and riding around the dough hook. If it is still too soft, add an extra tablespoon of flour until this is achieved. 4. Turn the dough into a well-greased large bowl, cover with plastic wrap and a warm tea towel and set aside in a warm, draught-free place for 2 hours. I put mine in the oven and turned my oven onto the lowest setting, as I had no sunny place. Turn out onto a floured board, knock the dough down and return to a clean, greased bowl smooth side up. Cover with plastic wrap again and refrigerate overnight. 5. Next morning, remove the dough from the fridge and leave at room temperature for an hour. Turn the dough out onto a lightly floured board and press down. Divide into 16 pieces and flatten a little. Arrange 4-5 raspberries on each piece, fold the edges in to the centre and mould the dough to make a smooth ball. Gently roll the dough around in a cupped hand on the board to make a tight ball with a smooth top. Make sure you enclose the berries in the middle, and roll to seal any cracks or gaps, as the juice will leak out otherwise. 6. Place the brioche dough balls on a well-greased or baking paper-lined tray about 1.5cm apart. Cover with a clean, light cloth and leave in a warm place for about 1½ hours. The dough will still be chilled from the refrigerator so the buns should not rise too much. You only want them to rise quickly when they go into the oven. 7. Brush the buns with beaten egg to glaze and pipe crosses on their tops with a slurry dough mixture of 3 tbsp of white flour mixed with water until you have a pasty consistency. 8. Bake at 200ºC in the centre of the oven for 15-18 minutes or until well risen and golden. Transfer to a cake rack and serve warm. This recipe is rather involved and I get best results by using the dough hook attachment on an electric mixer. Alternatively, you can prepare the dough by hand but you will need to double the amount of kneading time to achieve a light texture and end up with a sore elbow. First published Canberra Times 3 April 2012. There is no doubting the extravagant appeal of this special occasion cake, and it really is the perfect chocolate indulgence for the Easter break. With that wow factor appeal, this torte is usually greeted with gasps of delight when presented to an appreciative dinner group, then inevitably followed by more muted sounds of approval, as guests savour its taste and texture. It made a festive party dessert, enjoyed during the countdown to the 2012 new year. This group, dedicated to the appreciation of the grape, tasted a number of luscious magnums of well-aged reds. This torte, accompanied by a short black, held its own, proving to be a worthy finale to the old year. I am under no illusion, that these are the sorts of overblown sentiments that tend to come with the occasion and magnums of well-aged wines. The qualities of this torte has proven itself to be well appreciated when sober too. 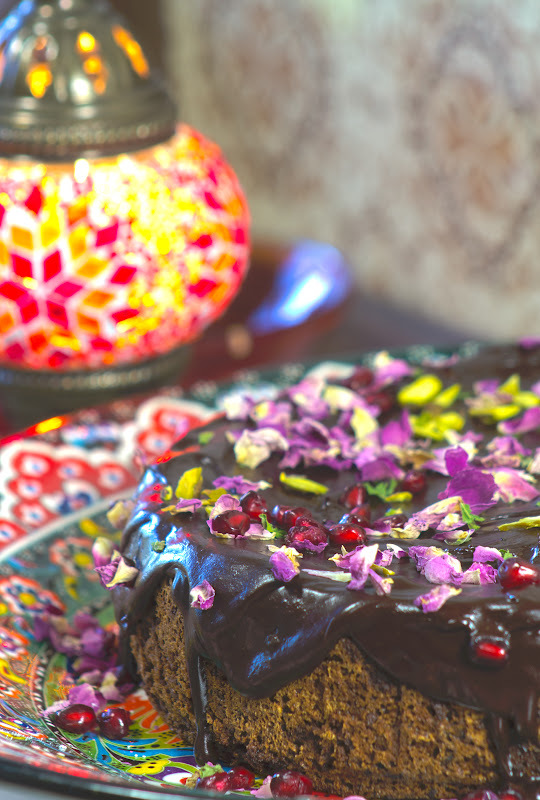 I think the addition of Turkish delight lifts the cake to another dimension, bringing the flamboyance and exotic flavours of Turkey right into the dining room. A version of this bejewelled concoction has featured recently on a foodie television show and another adaptation of this cake was published last year in the Delicious magazine. I rate this as my favourite cake recipe. It’s got the looks and flavour, the recipe is a solid performer and will appeal to anyone that loves Middle Eastern flavours. 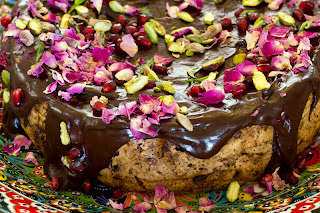 This cake couldn’t be easier to make, it’s a flourless chocolate single layer cake with a crown of dark chocolate ganache, decorated with jewel like pomegranate seeds, pistachios, edible rose petals and some mint leaves. The cake itself tastes deeply of chocolate, with almost bitter notes that penetrate the whole bite. Preheat the oven to 170C. Grease and line the base and sides of a 24cm spring-form cake tin with baking paper. Beat eggwhites until stiff peaks form. Gradually add sugar beating constantly for about 5 minutes, or until the egg whites are thick and glossy. Fold in the almond meal, halva, Turkish delight, nutmeg, rosewater, dates, orange zest and the finely chopped chocolate until just combined. Spoon the cake mixture into the cake tin, then bake for 1 hour and 20 minutes or until firm when touched in the middle. Do not overcook as the cake will dry out. When you remove the cake from the oven and still in the tin, poke about 10 holes in the top of the cake with a skewer. Pour the brandy over the cake, then leave to cool completely in the tin. Meanwhile, for the chocolate ganache, place the cream and chocolate in a pan over low heat, stirring until smooth. Remove from the heat and stand for half an hour or so, until it is a thick pouring consistency. Remove the cooled cake from the pan, carefully removing the paper from the base and sides. Transfer the cake to a serving platter and pour over the ganache, allowing it to drip down the sides. Decorate with rose petals, nuts, pomegranate seeds and mint leaves. 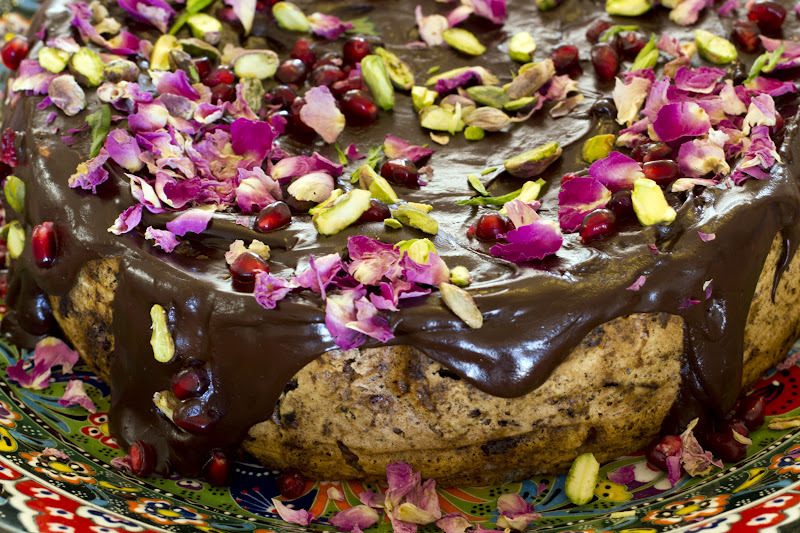 Tip: You can buy chocolate halva from many of the local IGA stores in Canberra and edible rose petals can be bought from good delis and Essential Ingredient.